A STRIKE in the 89th minute by defender Stevie Saunders gave Dumbarton a deserved point at the Tony Macaroni Arena in Livingston. A STRIKE in the 89th minute by defender Stevie Saunders gave Dumbarton a deserved point at the Tony Macaroni Arena in Livingston in front of a good pre-Christmas crowd of 942. 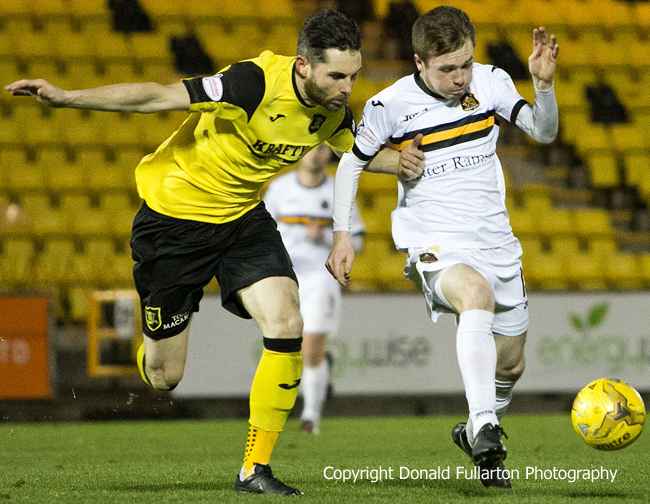 For a long time it looked as if Scott Pittman's 14th minute goal would decide the outcome as Mark Burchill's Livi Lions — with a strong wind behind them — dominated the first half but could not find another goal. In the second period Dumbarton had the wind advantage and had long spells of dominance, but could not gain the vital leveller. With two minutes left a Mark Docherty corner was pushed out from under the bar by the home keeper, but Saunders was first to the loose ball and hammered into the roof of the net to make it a deserved 1-1 final score. It leaves Sons unbeaten in three league games and a cup tie, having taken seven points out of nine to sit in seventh place in the SPFL Ladbrokes Championship as 2016 approaches. The picture shows young Sons striker Donald McCallum racing past ex-Son Ben Gordon.